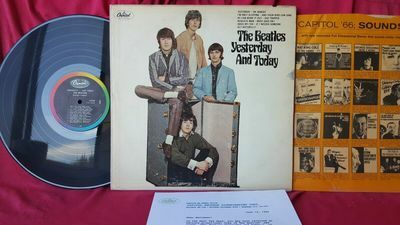 The Beatles "Yesterday And Today" 1966 "Butcher" cover, Capitol T-2553 mono LP, nice overall VG or better paste-over, 2nd-state copy, complete with correct matching L.A. golden-rod orange inner sleeve, and a copy of the letter of recall, the cover has clear tape along all edges (that doesn't seem to be on the slick), presents well, see all photos, the labels are in EXC condition, nice beginning copy, priced to go. U.S. buyer to pay $4.00 media mail (priority available upon request). Insurance is at the discretion of the buyer. International buyer please inquire for shipping costs which may include insurance and/or registered mail.